One of the things I was happy to have back in my life post-vegan days… dairy (this is an understatement for my husband). Specifically though, it’s grass-fed only. Happy cows, Happy earth, Happy Me. Here’s an easy recipe for making it. It’s creamy, tangy, full of flavor, and downright refreshing. Some people call this yogurt cheese, but I call it cream cheese because when you use Straus whole-fat yogurt, it tastes and feels like creamy cream cheese. Get some Straus and begin (I buy mine at Whole Foods Market or Sprouts Market). The gist of it goes like this. Strain the whey off grass-fed whole-fat yogurt (save the whey for other recipes or soaking nuts/oats, etc). I prefer Straus brand because of the flavor, and I like the company. Easy and empowering. Tastes better than what you can buy, too. It’s the freshness I think. No added preservatives. Get a quart of grass-fed whole-fat yogurt (like I wrote, I prefer Straus for extra “cream cheese-y flavor”). Strain it through a thin tea towel, over a mesh strainer, and into a bowl. Get that? You have a bowl, with a strainer in it, with a tea towel in the strainer, with the yogurt in the tea towel. Cover the strainer with a plate or something. Let it set like this for a few hours on the counter. Then, carefully pull the corners and sides of the towel up and tie the ends around a wood spoon (or similar device). It should look like a stork carrying a baby-type of thing. Gently remove the towel with the yogurt and transfer it to an empty water pitcher, with a large enough opening where the towel can hang suspended inside the pitcher. 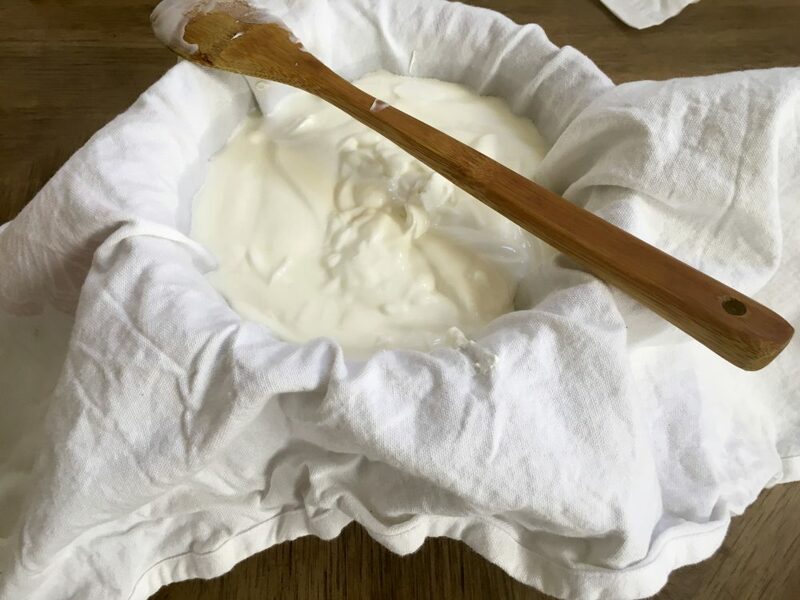 So, picture in your mind… the wood spoon has the towel hanging from it (ends tied onto it) so that the yogurt is hanging in the towel, like a weight. This is inside a large vessel or vase of some sort with the wooden spoon crossed over the top rim, so the towel can hang inside the pitcher, suspended, letting the whey drip more and not touch the whey that accumulates in the bottom of the vessel. The weight of the yogurt will cause it to drip whey off the yogurt, leaving you with cream cheese. Transfer this nifty contraption into the fridge overnight. It should feel firm at this point and stopped dripping. Remove the towel and open it up on a counter. 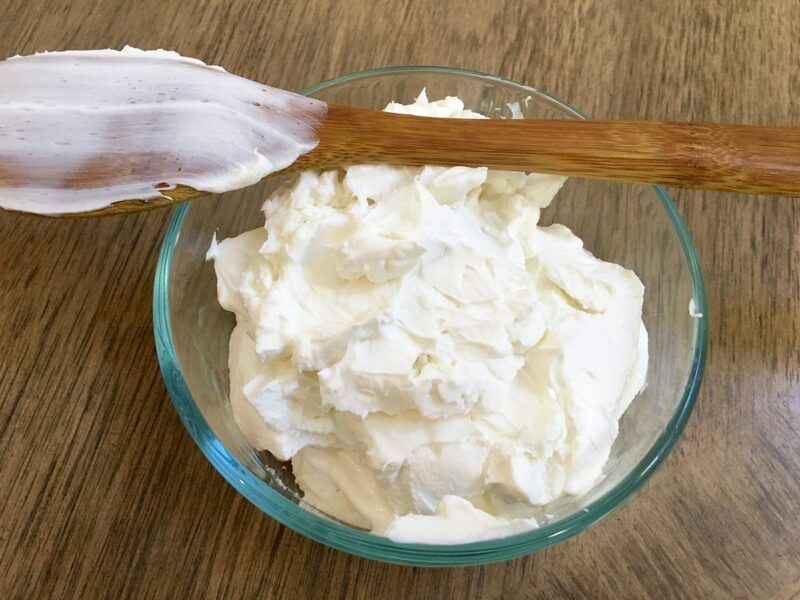 Scrape off the cream cheese and transfer it to a container with a lid. You just made cream cheese. This will last for up to a month in the refrigerator but of course you’ll have eaten it long before then.